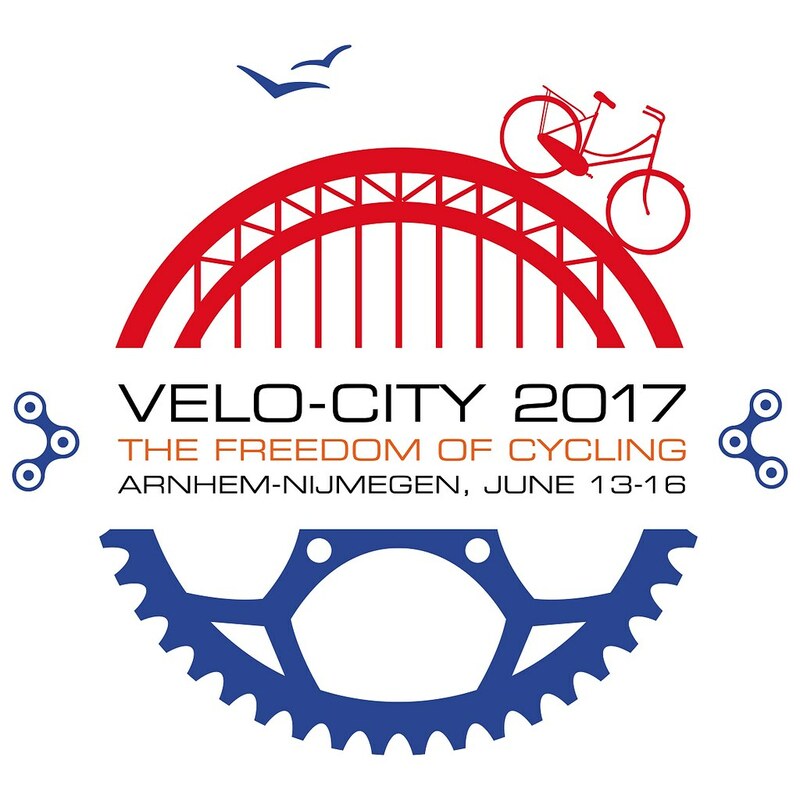 Transportation experts, mayors, town councillors, advocates for liveable cities, roading engineers, documentary film-makers and of course cycling enthusiasts are among the delegates. 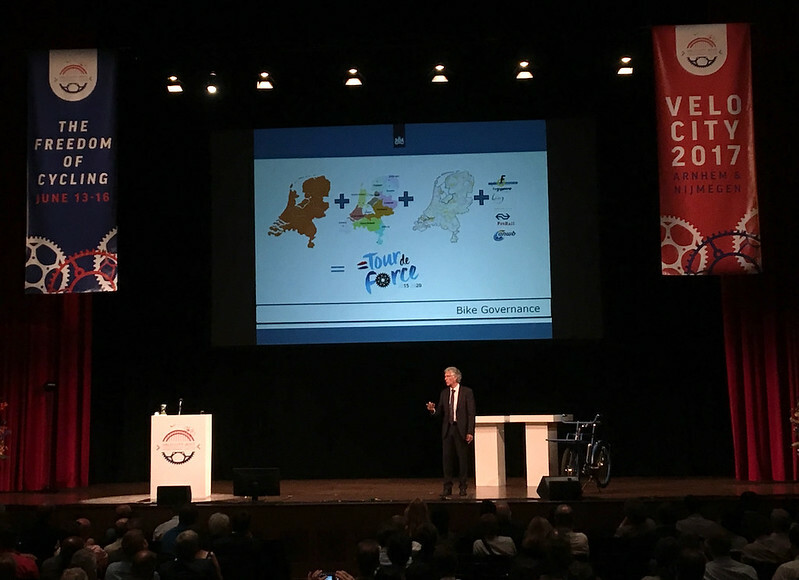 The European Cycling Federation, the peak body for cycling advocacy in Europe, organises the event, VéloCity, and this year it was held in Nijmegen, Holland, a town heralded as ‘the home of cycling’. 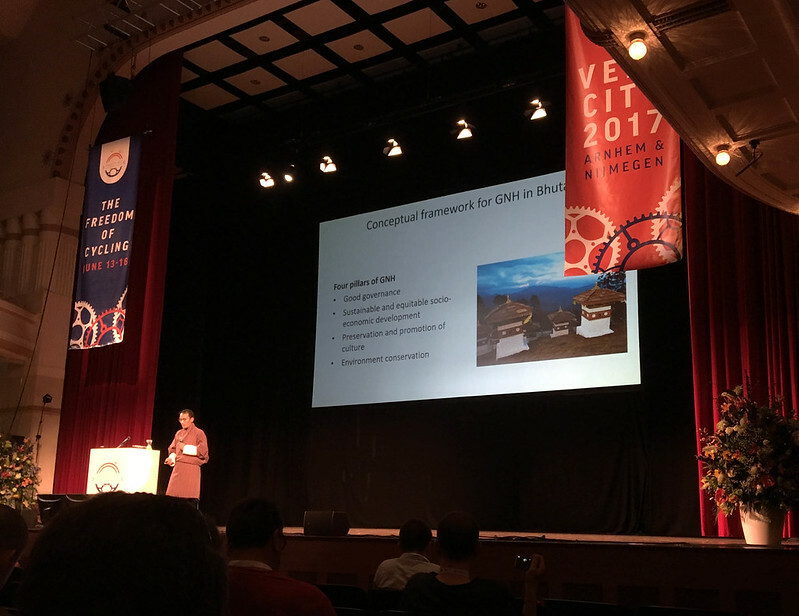 This year was the biggest ever, with more than 1,500 delegates, over 260 speakers, 107 sessions in two conference halls, with an added 60 outdoor sessions or excursions. Kiwis from academia, from private consultancies, and from NGOs like CAN were at hand to bring lessons back to New Zealand. These are some personal notes from a CAN Exec volunteer which may be of use by CAN local group members round the country. 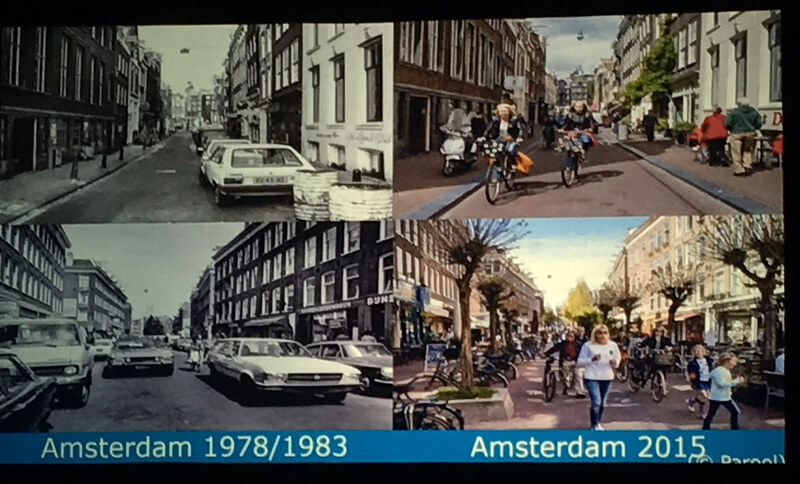 A talk by ‘Dutch Cycling Professor’ Marco te Brommelstroet (University of Amsterdam): Junctions in Dutch cities flow busily with hundreds of other cyclists and pedestrians. 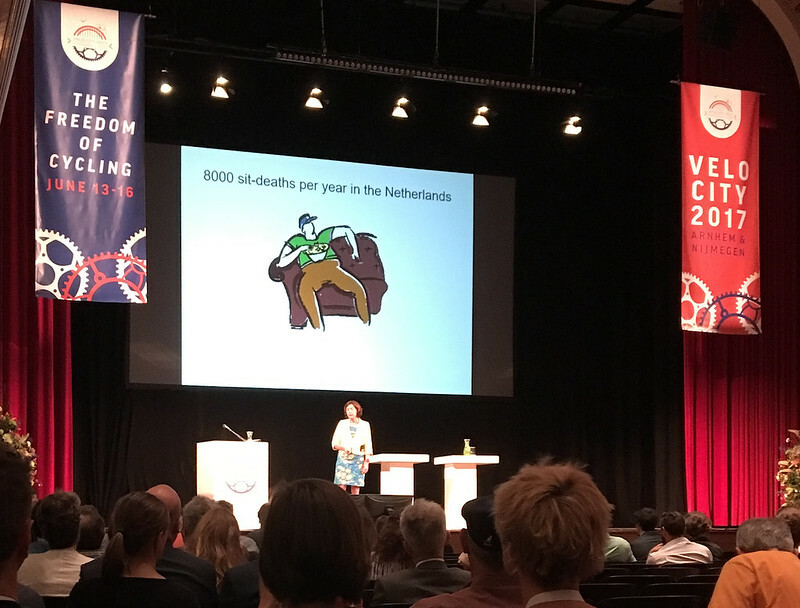 The Professor graphically showed how Dutch cyclists negotiate their way through these seemingly lawless spaces. They use eye-contact, small gestures and body language to claim or yield right-of way, slowing, speeding or turning slightly to let each other pass smoothly (continues below). The lesson was that the approach we take to controlling car traffic -a ‘machine-based’ system with simplified rules, signals and signs is better replaced, when we're managing cyclists, with a ‘human-based’ approach which allows ambiguity, rapid decision-making, and flow. It’s similar to the way a flock of birds or shoal of fish can turn and wheel gracefully and safely (only in two dimensions for cyclists of course) and the goal is to enable cyclists to ride in the enjoyable 'flow' zone between boredom and risk. Professor te Brommelstroet was also involved in making the eye-opening documentary, ‘Why We Cycle’ which is well worth a watch; here's a precursor video on YouTube. Key is that speeds are low so any potential collision has minimal risk. It's no joke! Cyclists know the pleasures of free-wheeling down a hill, getting to work with a healthy glow or clearing a grumpy head by going on an energetic ride. Hard to put quantities or costs on, but very important! We had two great talks about how cycling contributes to National Happiness (continues below). 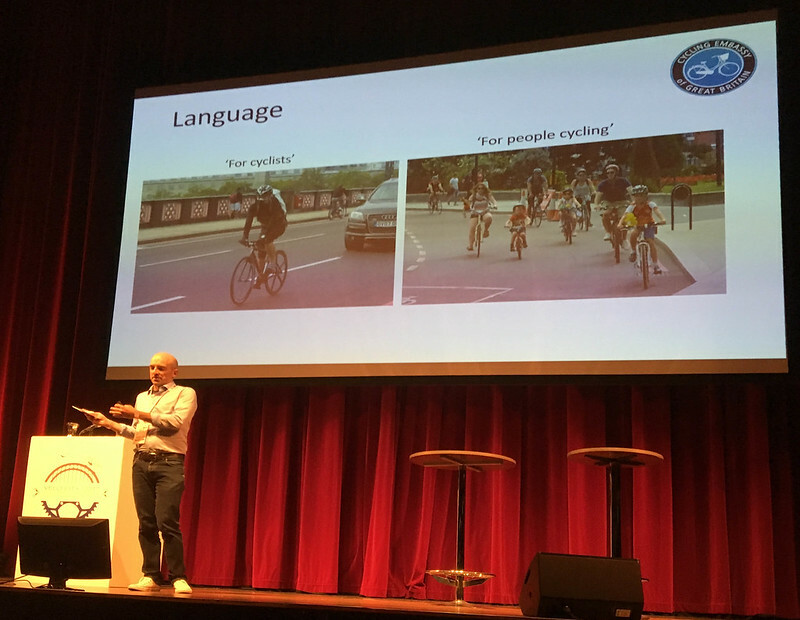 The keynote address came from Leo Bormans, author of the World Book of Happiness, who described how cycling contributes to personal happiness. Improving balance, increasing trust, the feeling of freedom, independence of transport, improved social connectedness, not to mention better health were all factors that made a convincing argument to present to your local Council or transport forum in favour of provisions for cycling. Thinley Namgyel, Chief Environment Officer in the Royal Bhutanese Government explained how cycling contributes to the Gross National Happiness of that Himalayan country. Members of the Royal Family of Bhutan are regularly seen using a mountain bike. 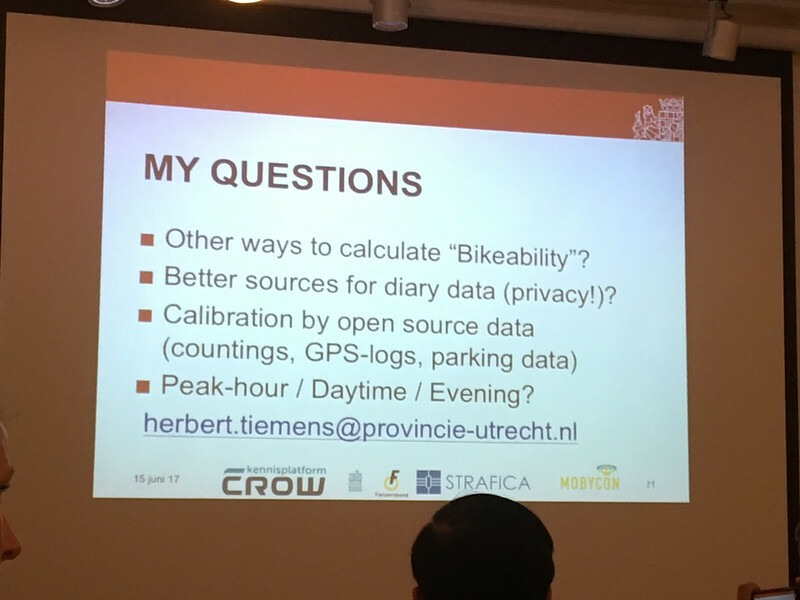 Here are some slides on background and tactics from cycling policy writer Jeroen Buis of JB Consultants (continues below). They outlined how Councils co-operate with private industry, advocates and other groups. 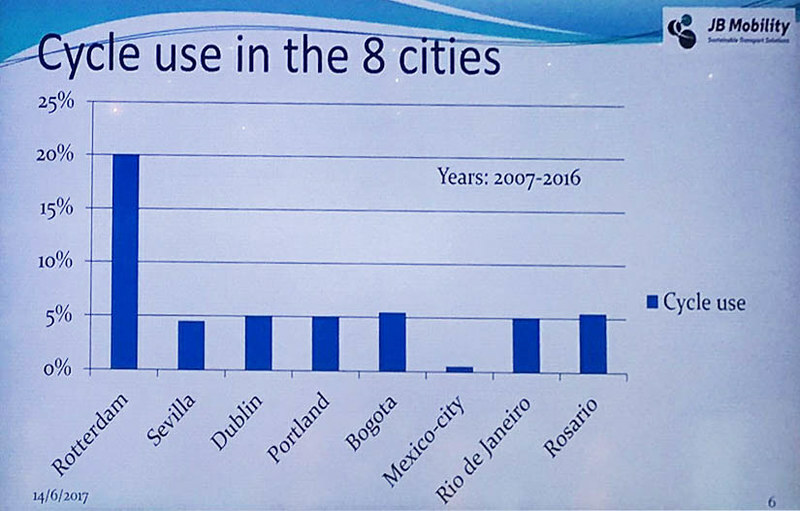 Comparing eight cities, Jeroen and colleagues from Brazil and the EU looked at plans and policies, institutional structures and capacity building (continues below). 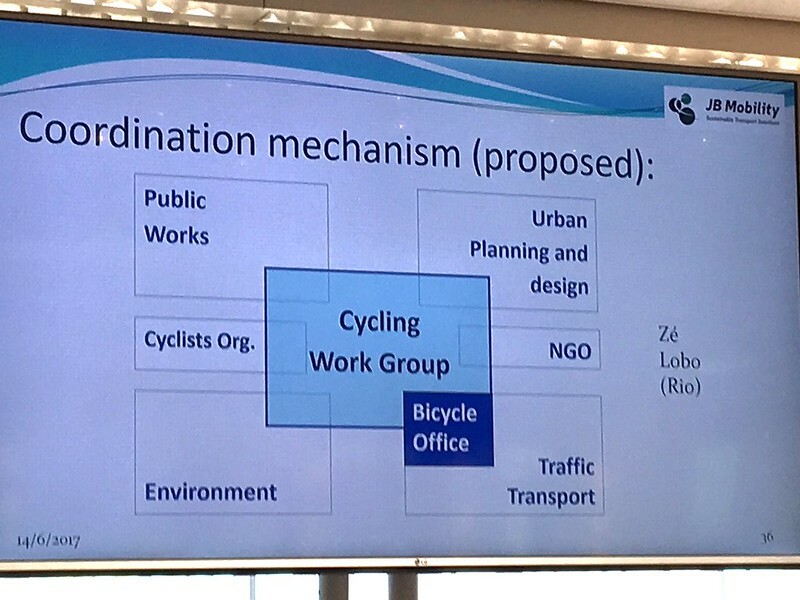 They recommend a strong cycling office within the transport & traffic department of the city’s administration. 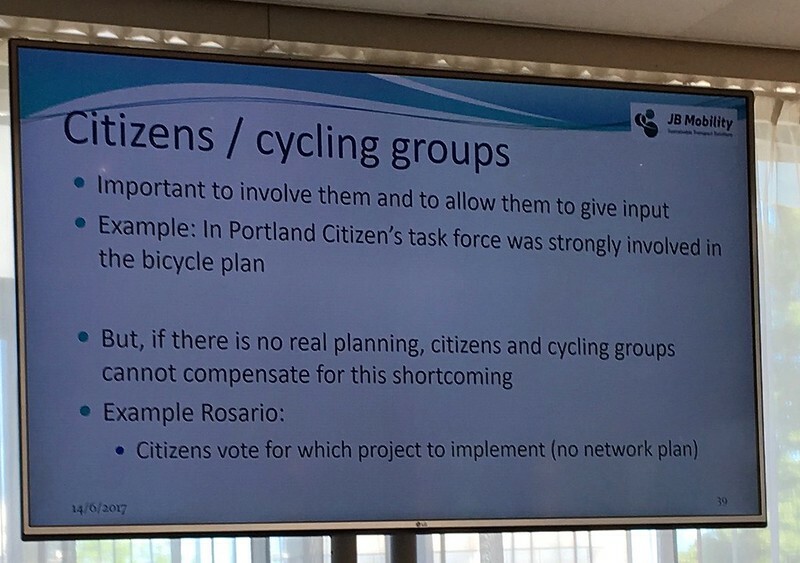 A cycling ‘work group’ or forum attached to that can gather expertise from other parts of the Council and from NGOs like the local groups of CAN (continues below). 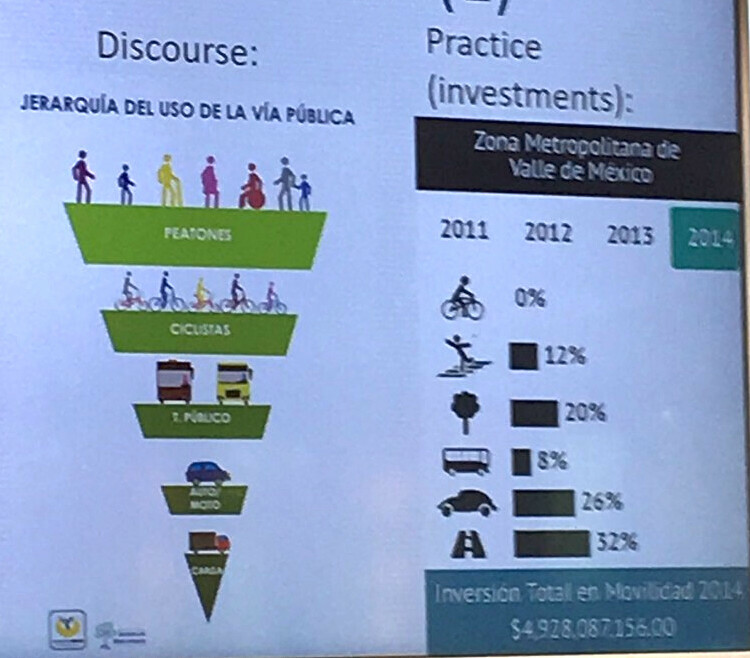 This 'Discourse' slide compares how often pedestrians and cycling are mentioned in official discourse, compared to how much money is invested for them —pretty striking! But an important message is how important NGOs and advocates are in creating meaningful city policies to grow cycling. Clarisse Linke of ITDP pointed out that transport is not gender-neutral: our policies and culture round transport can help or hinder gender equity (continues below). 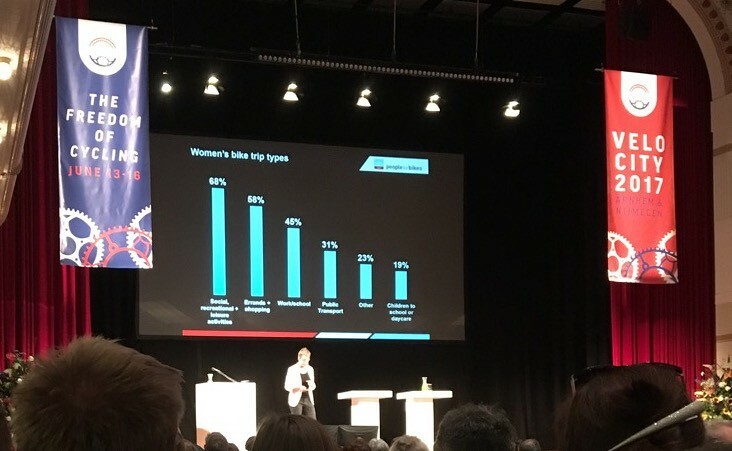 This is particularly stark in New Zealand where significantly more men than women cycle for transport, but the talks I attended on this topic focussed on the developing world. Roskowski reminded us that women’s triple role (firstly in the productive (paid) economy, secondly as a result of disproportionate reproductive responsibility, and thirdly in community management) mean they have different trip patterns to men with more ‘chain’ trips rather than ‘pendulum’ ones. In Chile, 25% of trips are for work and made by men, but only 13% by women. But 5% of trips are for shopping by men, and whopping 12.4% by women. In other words women do over twice as many trips for shopping, and less than half the number of trips to work (Lake Sagaris). Less than 10% of the 1% of regular cyclists of Sao Paulo are women. 68% of women’s bike trips in Brazil are for social, recreational and leisure trips, with only 45% work-related. The conclusion of these researchers is that in developing countries, the failure to provide equity in transport choices deprives many of opportunities for self-development (continues below). Women prefer to ride with friends than take public transport alone (Martha Roskowski, People for Bikes). Kristina Jasiunaite of World Bicycle Relief and Maria Hopman of Radboud University were others who were inspirational in their work for gender and social inclusivity. They all found the bicycle to be an important tool for this critical goal and each is worth a quick online search. Whatever we can do to improve the poor gender ratios in cycling in New Zealand would be invaluable and there may be inspiration and tactics applicable from developing countries here, too. Conditions for children cycling in the Netherlands are so good, an application will be submitted by advocacy group Fietsersbond for it to be added to the UNESCO’s list of Intangible Cultural Heritage (continues below). Check out the Cycling in Christchurch blog (offline at the minute, but bookmark it to check back!) for some really good analysis of cycling conditions in the Netherlands. That’s creating computer models of cycling traffic, either existing or projected. This class offered a lot more interest than you’d think at first. Proper statistical predictions and analysis of cycling numbers, who's cycling and what routes or roads are attractive to cyclists is critical. 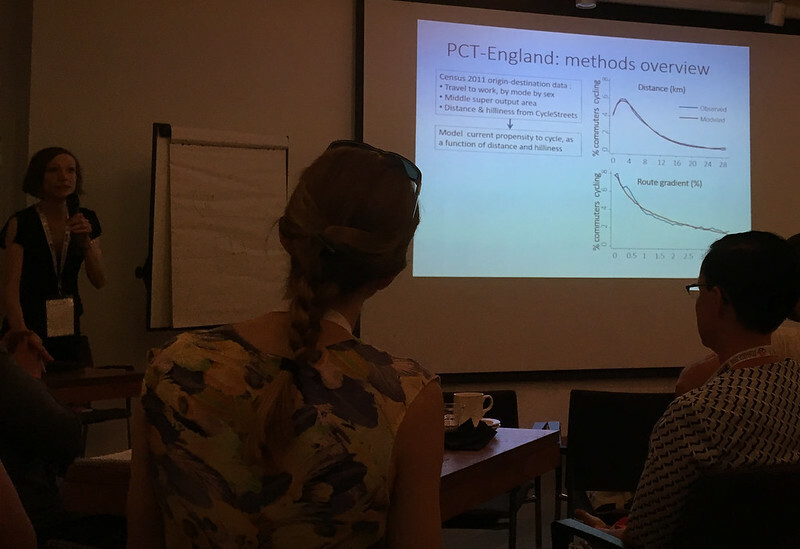 Rachel Aldred of Nottingham University and Herbert Tiemens outlined their research into how to predict cycling uptake, and classify cycling routes in order to better plan them (continues below). Advanced computer modelling allied with clever use of data helps decision-makers and network designers. Check out Dr. Aldred’s work including the ‘Propensity to Cycling Tool (PCT)’ at rachelaldred.org. Images are important; make sure when you do public events you wear normal clothes rather than 100% hi-vis and lycra -to emphasise that cycling is for everyone, not just those keen enough to get into specialist clothing. In the UK and Netherlands the advice is to have some cyclists appearing without helmets to demonstrate that cycling can be extremely safe depending on your route & behaviour, but of course in New Zealand this isn't applicable. 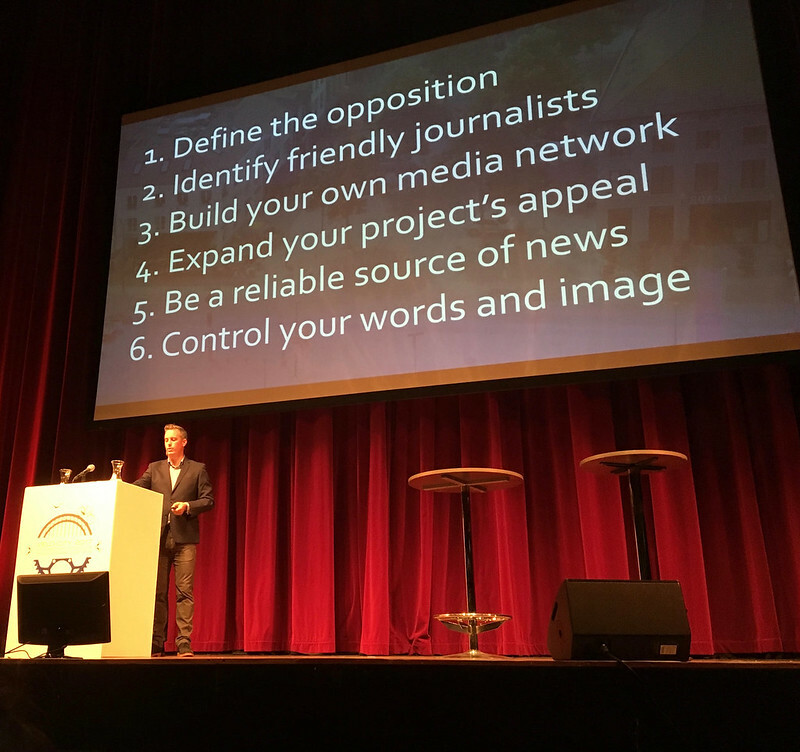 Constituents are the currency of politicians, and clicks are the currency of newspaper editors. Editors carefully curate and adapt their stories to attract the most clicks (continues below). Be a reliable source of news, they added e.g. feed news editors regular stories and ‘sub-stories’ as a cycle lane project progresses, not just one final story. 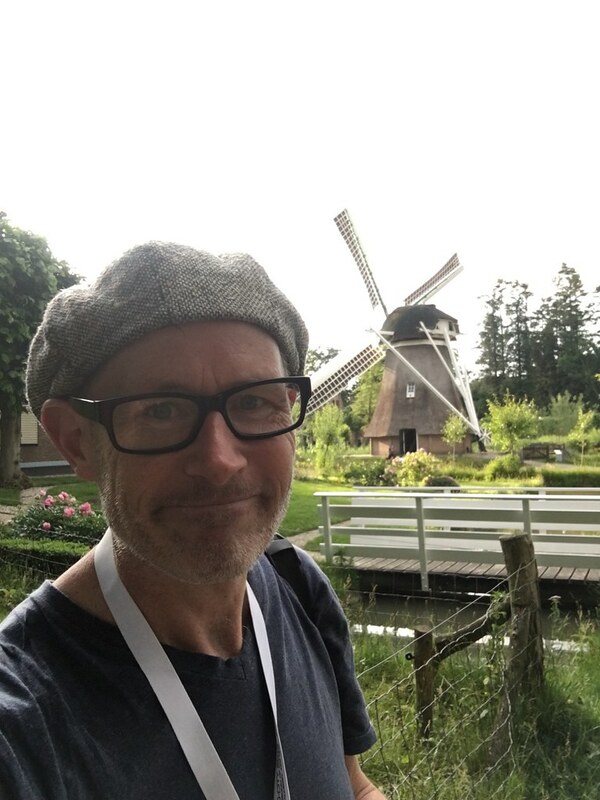 Finally an interesting fact from Mark: the Dutch have two words for cyclists: one for what we’d term a ‘Roadie’ (an athletic fully-equipped road-going cyclist on a lightweight bike) and one describing a regular person just using a bike for transport. This gives an advantage over English-speaking countries where many people only know cyclists as something like the MAMIL stereotype, and we’re seeing a trend of avoiding the word ‘cyclist’ in some contexts in favour of the longer ‘people on bikes’. Eight: Don’t believe clickbait headlines! The UN's Global Development Goals are a set of eight goals to end poverty, protect the planet and ensure that all people enjoy peace and prosperity. Increases in cycling for transport have been shown by ECF to support these goals in many ways. The ECF -through its new World Cycling Alliance initiative- presented evidence to the World body creating Habitat 3 in Quito recently and succeeded in having cycling mentioned in the text of the new agreement (continues below). Some of the major world issues that cycling can help with include: Improving womens’ mobility; improving lower-income mobility; reducing congestion and pollution. 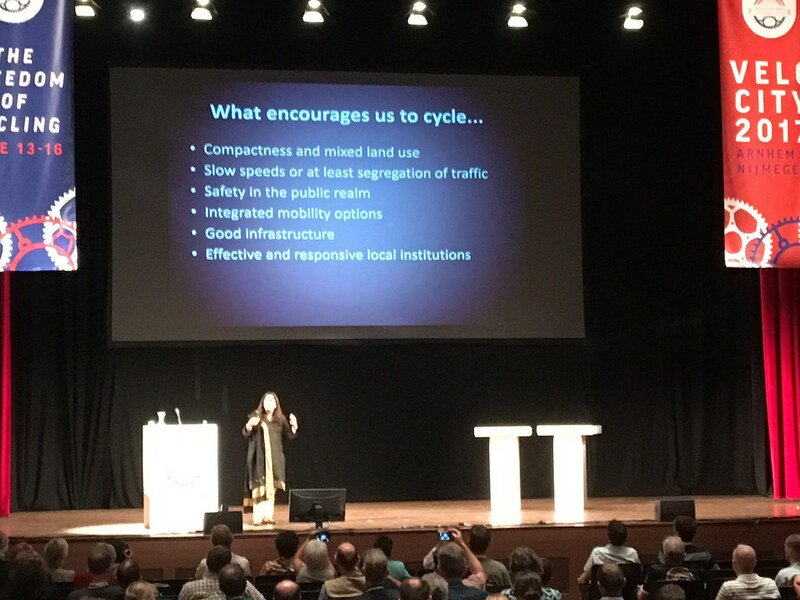 Shipra Narang Suri of UN-Habitat crystallised the challenges not only of growing cycling numbers but of creating functioning liveable cities in a rapidly developing world. See our report on attending the World Cycling Alliance for more info. 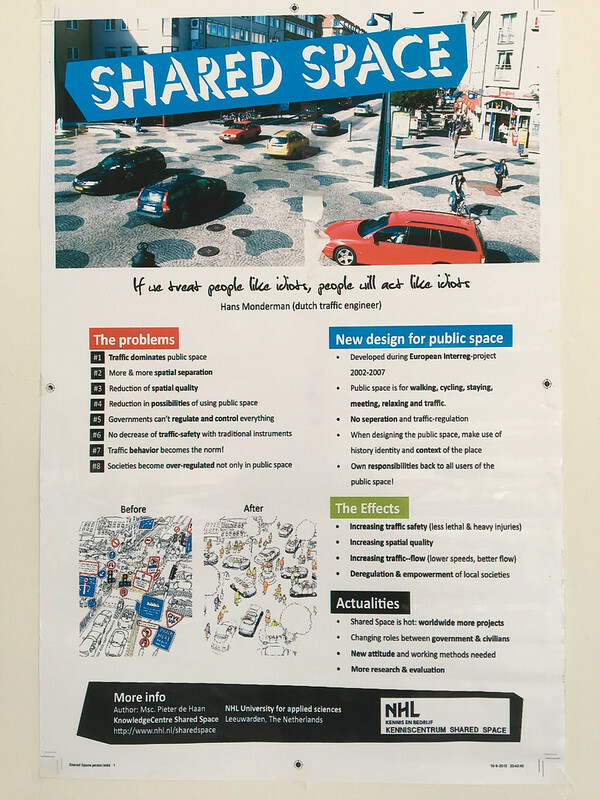 'Shared Space' is the term for streets, roads or public spaces that don't have the traditional segregation between pedestrians, cyclists and motor vehicles. Often such spaces are made with the same paving from the facades of buildings on one side, right to facades on the other, without kerbs, marked lanes or centrelines. The idea is that by reducing the explicit provision for road suers, individual responsibility is increased and people look out for each other. Motorists will naturally driver slower, for example, and cyclists give space to pedestrians, according to the concept. 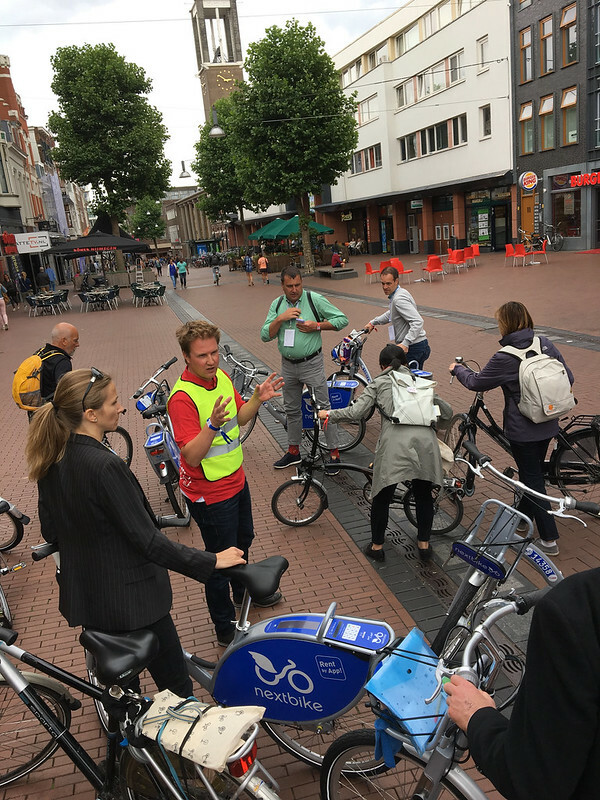 A workshop on shared spaces demonstrated three examples- two working pretty well from our brief observation, and one that seemed to suffer confusion between cyclists going different directions on crossing routes, pedestrians and buses. 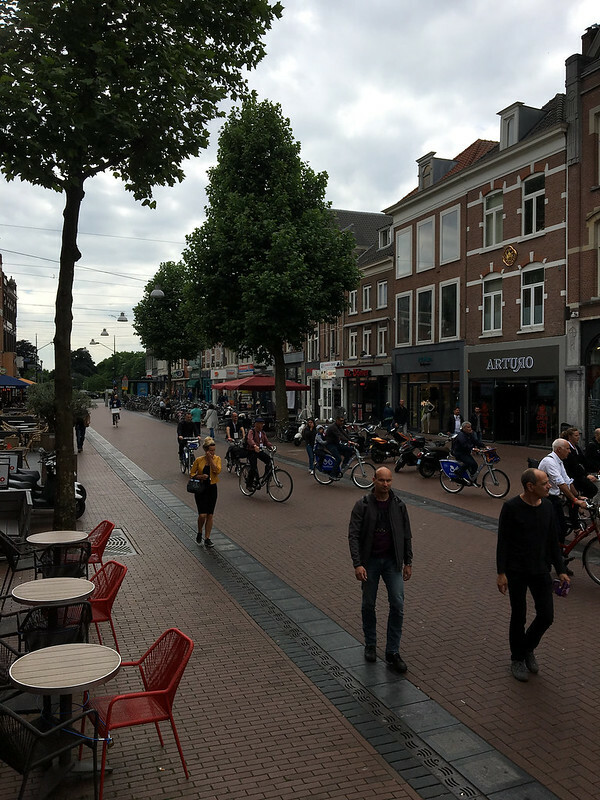 The former street in these photos that had been paved and pedestrianised (no motor vehicles) worked well — but it was clear which zones were for sitting and which for moving (continues below). 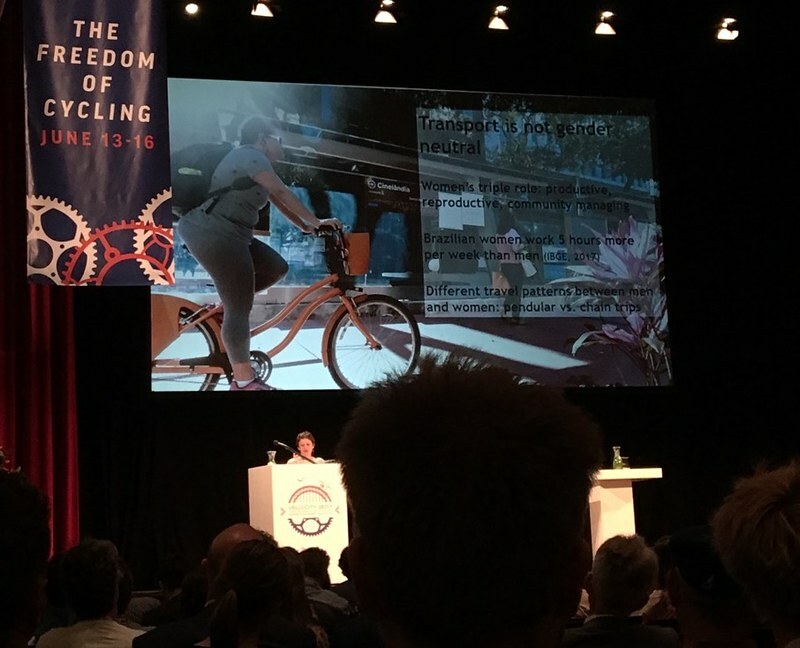 Raymond Gense from Next Urban Mobility claimed that the bicycle industry will overtake the automotive industry in terms of innovations, due to the long car product cycles of 4 to 8 years compared to shorter periods for bikes. The ‘connected bicycle’ will become a full partner in Mobility as a Service Systems, improving the usability side of mobility systems, said Gense. On the other hand Niels Hoe, from HOE360 Consulting said, ‘I would like to un-smart cities. Cycling is a great active transport mode because it’s simple: let’s keep it that way! Cycling is about human interaction, about enjoying one’s city and time, and I don’t see a real need for technology in this’. Sounds eminently sensible to me, Niels: Keep it simple! Cycling already delivers 513 billion EUR of economic benefits in Europe every year and the ECF reckon that, with good policies in place, that number can increase to 760 billion EUR by 2030. Bram Nieuwstraten of Amsterdam Vervoersregio (Transport Region) reported impressive results of the first Bus Rapid Transport line that was introduced in 2002 operating buses from Haarlem to Amsterdam. Replacing an existing conventional bus line with much fewer stops, bicycle parking was installed at the bus stops to address the issue that customers now had to travel longer distances to the bus stations. His figures showed that people are willing to walk 500m to traditional public transport services and 700m to high-end public transport services; with cycling those figures can increase to 1.9 km, serving a far higher population. It's been such a success that bike parking at the BRT stations has been increased 4 times in the fifteen years the service has run. Dutch trains are now 100% powered by wind energy. One hour's worth of power from a large wind turbine can power a train from Amsterdam to Rotterdam.